Jed Pressgrove dissects the academic prototype game Elude. One could call it a platformer, but Elude has zero interest in fitting into a particular canon of games. Instead, the game uses platforming as part of a canvas to express the evolving mood of a person with depression. This metaphorical approach makes Elude the most insightful game about depression that I’ve played. This isn’t to say that Depression Quest, for example, portrays depression less accurately with words and audio glitches. But after playing Elude, it’s clear words can only say so much about the feeling of being pulled down, the slowness of the climb out of the pit, the laborious idea of happiness, the precise effort it requires to live and succeed while depressed, when things that once made you feel better are no longer working. While Elude can give insight to those who don’t have depression, the game’s abstract approach, along with its prototype status, explains why it hasn’t received as much attention as The Cat Lady, Depression Quest, or Actual Sunlight. Developer Singapore-MIT GAMBIT Game Lab, which describes itself as a “research initiative,” specifically created the game to be “used in a clinical context as part of a psycho-education package to enhance friends’ and relatives’ understanding of people suffering from depression.” In its attempt to convey depression more universally, the game will not satisfy those who want a more personal and direct illustration of depression. Nonetheless, Elude is a valuable contribution that deserves more critical attention. Unlike the majority of games about depression, Elude seems like it takes a page from expressionist silent films. “There is no end. There is no beginning. There is only the passion of life.” This in-game text isn’t part of a story in Elude, but rather frames the emotional purpose of the mechanics, that is, how one’s mood might change based on the control the game gives or takes away during a visual cue. Depression Quest and Actual Sunlight have received a lot of attention for taking narrative options away from the player to indicate the debilitating effects of depression. Losing control of the avatar in Elude is arguably more organic and urgent given that you are supposed to be driving the narrative through constant motion. 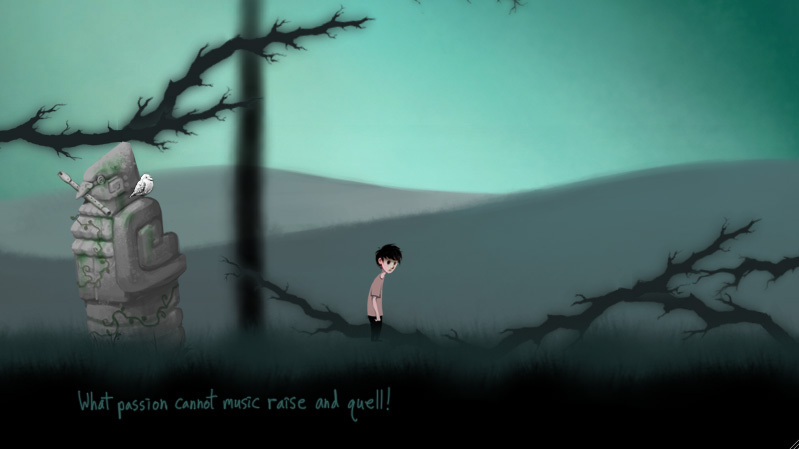 The platforming of Elude illustrates depression as a continuum of moods that are influenced by position. The higher you are, the less depressed you are, and vice versa. The game defines passion as a way to combat depression, but finding something to inspire passion is part of the challenge, as is resigning to the fact that certain things that once raised your spirits can fail to do so again. The default stage of Elude is a woodsy area where trees appear to be barely alive. To become passionate, you must “resonate” with birds perched on tree branches. Of course, you reach new heights by jumping from branch to branch, an ability that works better if you’re able to resonate consistently. Failing to resonate is somewhat comparable to a power-up not working in Super Mario Bros., but the former isn’t attempting to comment on brokenness – like Depression Quest, Elude subverts typical mechanics to demonstrate an inability to function as expected. If you can remain patient in Elude as you try to resonate, you can reach a brighter stage in the sky that requires you to bounce on leaf and flower platforms that disappear once touched. This glimpse of a better life suggests that managing depression is possible, but the coordination required to stay in the sky prevents bliss, and you’re likely to fall back down into the woods anyway. The catastrophic failure of getting pulled into the abyss below the trees doesn’t require as much effort as working your way towards the sky. Getting pulled down is simply destined to happen in Elude. Perhaps the portrayal of this mental and emotional abyss is where Elude shines in comparison to text-based portrayals of depression. While an individual describing a personal abyss can help spread awareness, this communication is based on what the individual can subjectively communicate and what the audience can subjectively interpret. On the other hand, the feeling of being in an abyss can be more closely approximated through the loss of full control and complementary visual concepts of Elude. Of course, this universal approximation is theoretical: the game needs to be tested, like a hypothesis. It is undeniable, however, that the game portrays the deliberate journey out of the abyss as an effort in faith. The less faith you have, the more likely the game will drag you into a seemingly unending darkness. While Depression Quest explicitly tells you when a choice makes you more or less depressed, the platforming control – and lack thereof – in Elude provides a fluid theory for how depression might be managed for the better or worse. Theory is both Elude‘s great strength and weakness – it’s no surprise that the game’s credits feature psychology experts. Through the “feel” of the game, players might better understand the web of moods within depression. But without firsthand knowledge of how depression affects relationships, passions, and circumstances, one lacks the intense context of a living, breathing human. In this respect, Elude is weaker than Depression Quest and I’m Fine. Elude also cannot express the personal variability of depression because gender, class, race, sexuality, and other stratifying concepts do not exist in its world. Despite these conceptual limitations, which also register as marketing limitations, Elude shares ideas about depression in a way that, to my knowledge, no other game has. In one respect, the game is an academic exercise, an attempt to share a universal theory of depression. In another respect, Elude subscribes to the “show me, don’t tell me” approach that most games about depression counter with direct honesty – though There Are Monsters Under Your Bed is a notable exception. What truly separates Elude, however,is how it limits or eliminates platforming control to convey feelings or barriers that a person with depression may not be able to describe with words. The game’s importance lies in the fact that it doesn’t stand alone. Its connection between control and mood has amplified, not replaced, my understanding of other artistic expressions of depression. In this way, the game can remind us of the importance of broadening our understanding through both academic thought and personal expression. Even as a prototype browsergame, Elude shows we can always learn more about how humans experience life differently. Jed Pressgrove regularly writes at his blog, Game Bias. He has been published in Paste, Pixels or Death, StoryCade, and Defunct Games. First off, this was an interesting game to try – thanks for the recommendation. Even though Elude has an atmospherically and mechanically different feeling than a game such as the The Cat Lady, it doesn’t offset its own merits. It may not be as long as other games and lack dialogue and context/background for our character but I don’t feel like this takes away from our ability to empathize and understand and be impacted. I approached the game and played it before reading your article. The first thing i did was read the description at the bottom to see what I was getting into. My expectations were not to learn something but rather to be able to relate to someone. My perspective, therefore, is a bit different from yours. It may also not be the developers’ intended impact (to make a game with an emotion for people to relate to) but I’d consider it an happy accident. Every time the character rose or fell, I felt as though the game was able describe feelings I’ve had in the past rather well. Therefore, to Robert Yang’s dismissal I’d say that it’s unnecessary to mark-off a game for seemingly being unable to accomplish its primary goal. On one side of the coin, the game serves as a way to explain to “others” what depression looks like. On the flip, it serves as a beacon of empathy yelling, “I understand”. To someone who is depressed, just those two words can make a difference. But then to go on and paint the beacon as not only something that understands but as well as something that will explain in your place? Elude’s mechanic of fading to black when you’re in a dark hole devoid of passion points out exactly how someone in depression can feel about trying to explain. Someone feeling absolutely chipper and excited trips over words and fumbles over thoughts. It’s so much harder for someone lacking all motivation and filled with the molasses of lethargy to try and explain something they’ve already said countless times before all while overcoming the thought of, “It’s not worth it”. To be introduced a game that exists solely to illustrate feeling and thoughts without the fumble of words could be counted a blessing. I feel like the game lab has done with this piece and has the potential to go on and make more short, atmospheric games to explain other states of being for those who have not experienced it before and cannot relate and also for those who have experienced it before and want to be related to.